The company entered the arena last year with products that included the HX Data Platform, which joined SpringPath software with Cisco Unified Computing System (UCS) servers to form a distributed storage system using solid-state drives and spinning disks from server clusters. Cisco says HX Data and HyperFlex systems are extensible to support a range of hypervisors, bare metal and containerized environments in the future, Cisco says. HyperFlex will also be included in Cisco’s Application Centric Infrastructure SDN, and hybrid cloud and multi-cloud orchestration. Future support for ACI will result in an SDN that provides automated, policy-based network deployment that provides microsegmentation and multitenancy, Cisco said at the time of the announcement. Industry experts have noted though that while UCS and related product deployment have been slowed as customers reevaluate what they want to deploy in future data center transformation. Adding high-capacity all-flash nodes: Tied together with support for 40Gbps UCS fabric networking new HyperFlex HX220c M4 and HX220c M4 All Flash Nodes. Cisco says the system is delivered as a cluster of three or more Cisco HyperFlex HX220c M4 or HX220c M4 All Flash Nodes that are integrated into a single system by a pair of Cisco UCS 6200 or 6300 Series Fabric Interconnects. Each node includes two Cisco Flexible Flash (FlexFlash) Secure Digital (SD) cards, a single 120-GB solid-state disk (SSD) data-logging drive, a single SSD write-log drive, and up to six 1.2-TB SAS hard-disk drives (HDD) or up to six 3.8-terabyte (TB) or six 960-GB SATA SSD drives, for a contribution of up to 22.8 TB of storage capacity to the cluster. The nodes use Intel Xeon processor E5-2600 v4 family CPUs and DDR4 memory. 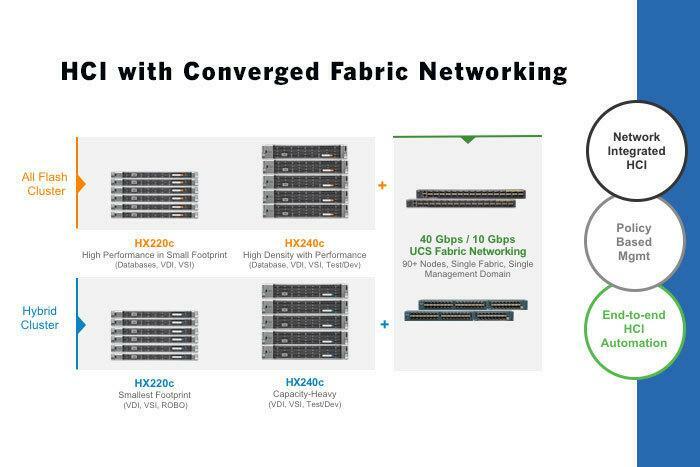 “HyperFlex All Flash nodes make it easy to extend the HyperFlex cluster to data and heavy, business critical workloads such as SQL databases and latency-sensitive applications,” said Todd Brannon, director of Cisco’s product marketing, Unified Computing Enterprise Product and Solutions. Offering easier system management: Cisco added a new HyperFlex Connect, standalone HTML5 interface for the management and orchestration of the HyperFlex environment from any device in real time. According to Cisco, HyperFlex systems can be managed as a single entity through a vSphere client plug-in to Cisco UCS management capabilities, or through the Cisco HyperFlex HTML5 dashboard. Built-in role- and policy-based management through service profiles and templates as well as automated let data center managers provision applications in minutes rather than days by associating a service profile with a new, added, or repurposed HX240c M4 or HX240c M4 All Flash Nodes. The UCS business has slowed as users build next generation data centers so Cisco needed to keep the pressure on by adding features to HyperFlex, said Zeus Kerravala, founder and principal analyst with ZK Research. It also keeps the pressure on competitors such as Nutanix and HPE/SimpliVity. Gartner says the market for hyperconverged integrated systems (HCIS) will grow nearly 80% to reach almost $2 billion in 2016, propelling it toward mainstream use within the next five years. HCIS will be the fastest-growing segment of the overall market for integrated systems, reaching nearly $5 billion (or 24% of the market) by 2019.